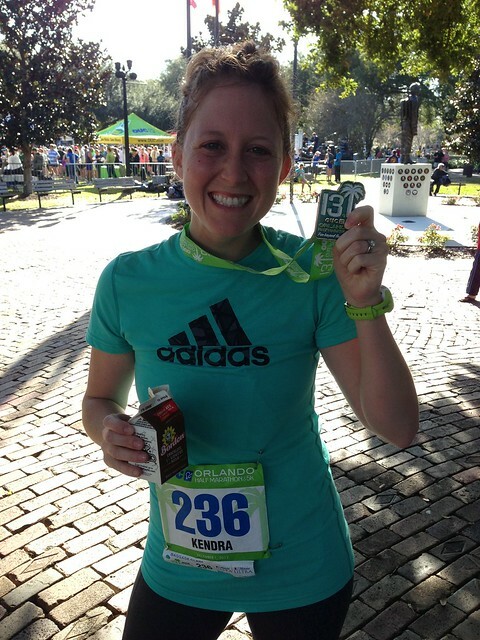 I ran my first half marathon on Saturday, December 1st, 2012. I still am somewhat in shock that I can even say that. This has been a long time coming, so, let’s rewind. One of my new year goals was to get back to my pre-pregnancy body. Almost a year later, I can say that I have completed that goal. Yes, breastfeeding for over 11 months helped, but I knew I also wanted to get back in shape. That’s where the whole crazy idea of running a half-marathon came into play, way back in March. 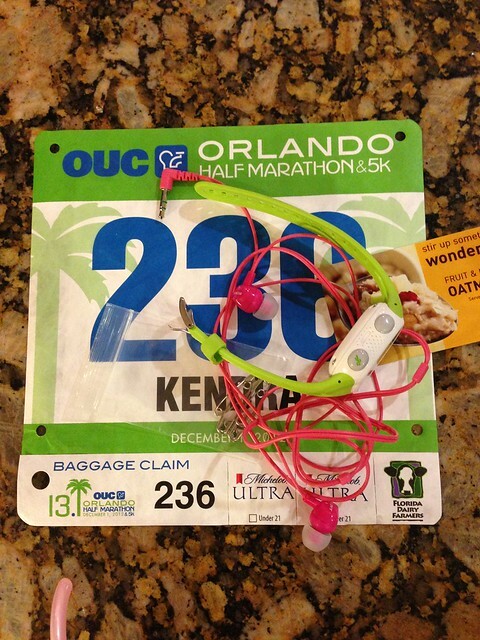 In July, I took the next step and actually registered for the race. It wasn’t the race I originally thought I was going to do, but it turned out to be one of the best decisions. I didn’t actually start training until the tail end of my breastfeeding days, which was early September. 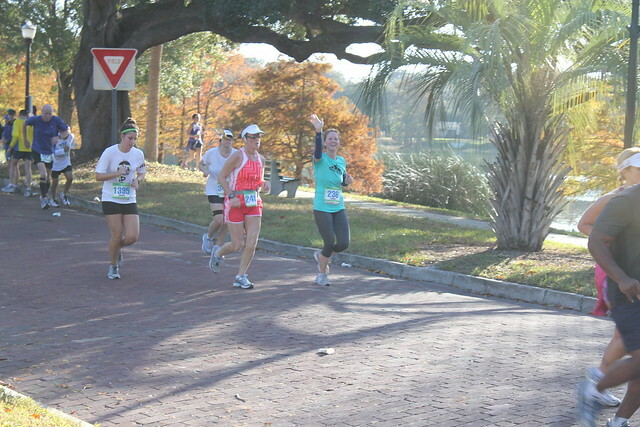 For three months, I followed the Half Marathon Training Plan by Cari Fit. but life does happen, and I didn’t stress out or get discouraged (too much) when it didn’t work out perfectly. Honestly, I didn’t do as much weight lifting as I would have liked and the interval trainings were few and far between. The intervals came in handy when I was pressed for time. I would bang out 2-3 miles in 20-30 minutes. I did make it a point to run 4-5 times per week. I usually took off Fridays and Sundays. 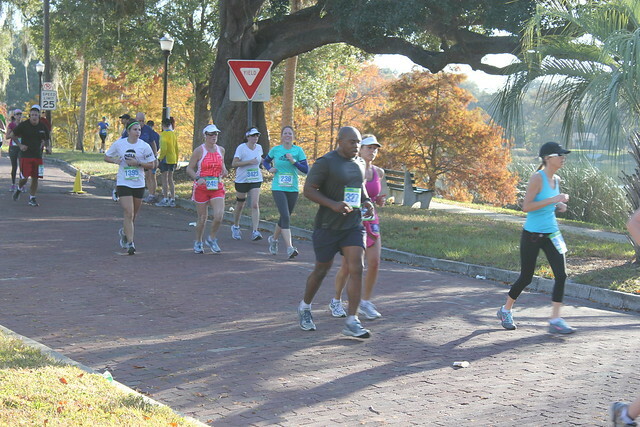 It helped immensely that Greg and I would run together during the week with the stroller. because it was so much easier to run without it! and that was three weeks before race day. I went down to 7 miles, then 4 the weekend before. I also only ran 3-4 times total the two weeks leading up to the race. This is not something I would do again, it just worked out that way since it was moving week. In the days leading up to race day, I was so incredibly nervous. Everyone kept telling me that, “I’ve got this” and not to worry, but I still did. which I didn’t mean to do; and my alarm was set for 5am the next morning. 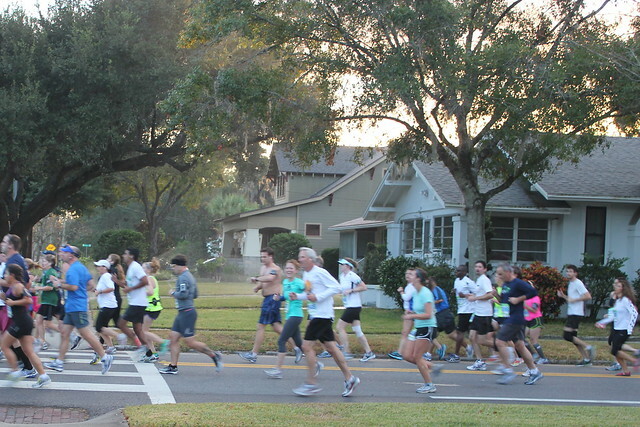 We headed downtown and arrived with about 30-45 minutes before the start of the race. but I opted for just walking around and stretching as much as I could. I started the race with our buddy, Stan. At the start line, we talked about our goals. The entire time I was training, I made a point not to set a time goal. I knew I just wanted to finish. And run the whole time. Run and finish. That’s it. based solely on my long runs that I had completed. The gun rang out and it took a couple minutes to get up to the start line. I knew I started out fast, but I didn’t realize how fast until I finished the first mile and my watch beeped. unexpectedly, between mile 1 and 2, so that was super fun and gave me a little energy burst. I think I was doing pretty well through mile 6. I opted for Gatorade instead of water at mile 3 and mile 6, and it tasted so good. but I knew Greg had the map and the suggested short cuts through the downtown streets. so he went ahead down the course to ensure he got a good spot to cheer me on. I remember passing 903 Mills Market after mile 9 and seeing a mom waive at her hubby and kids. I got a little choked up, wishing that was me. Sure enough, not a half a mile later, I see Greg and Kenley! Greg said she had been great and had been in the stroller the whole time! so her PJs and jacket were wet, but thankfully it wasn’t too chilly out. I tossed my arm warmers to Greg at this point too, so that was a good change of pace. After I saw them, I felt re-energized, which was awesome. There were also some really funny signs around the corner as I left them. Then, I could feel myself hitting the wall. Miles 10 through 12 were the absolute worst. No doubt about it, no way around it. 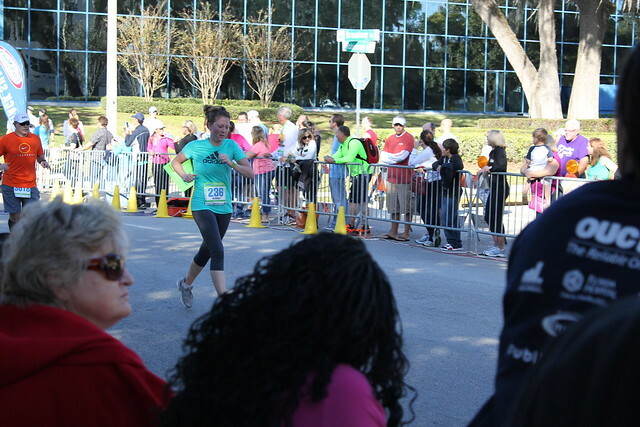 Once I passed the 12 mile marker, I felt better just knowing I was so close. 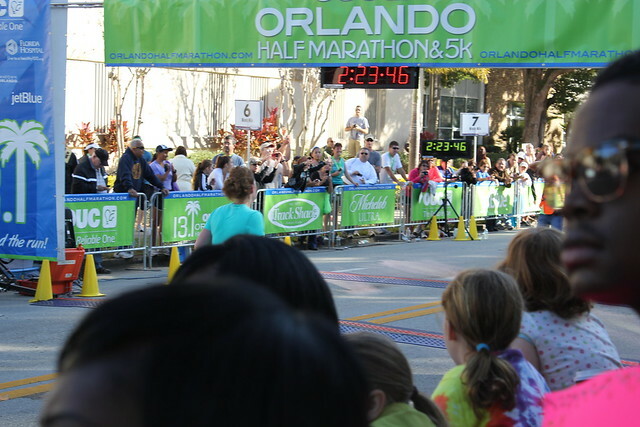 I reached Lake Eola, where we started, and could hear the finish line. so that was a bit of a let down, but again, I was so close. I saw Stan as I was coming in to the finish and gave him a high five. but I just crossed. And I was done. I immediately grabbed a cup of Gatorade, then went back for two more. I far exceeded my own expectations. 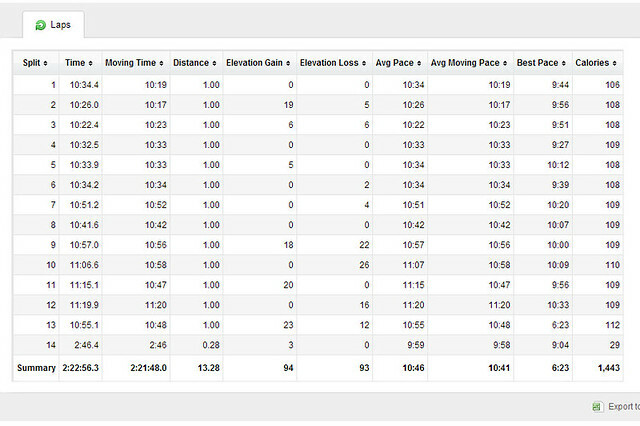 I ran the entire race and my average pace was 10:46/mile. but nothing too drastic and nothing I’m losing any sleep over. I told you that miles 10-12 were tough! The other tough part was the terrain. 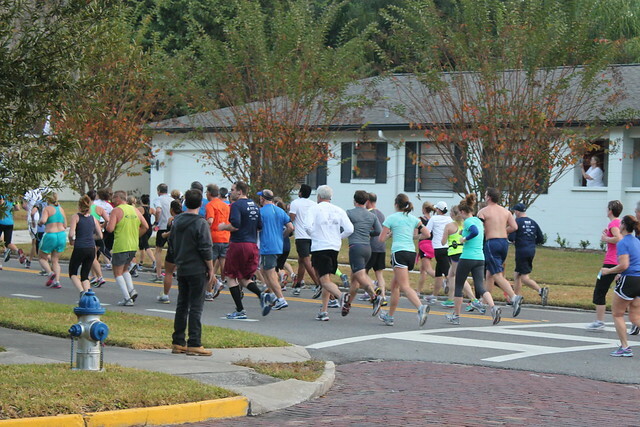 1.9 miles of the race were on brick roads. I am honestly shocked it was only 1.9 miles, it felt like it was way more. Apparently, there are also hills in Orlando. This was quite different than the flat, residential sidewalks that I had trained on. My legs felt the difference. but after 13.1, I could barely walk that night. It’s only 3 miles more! 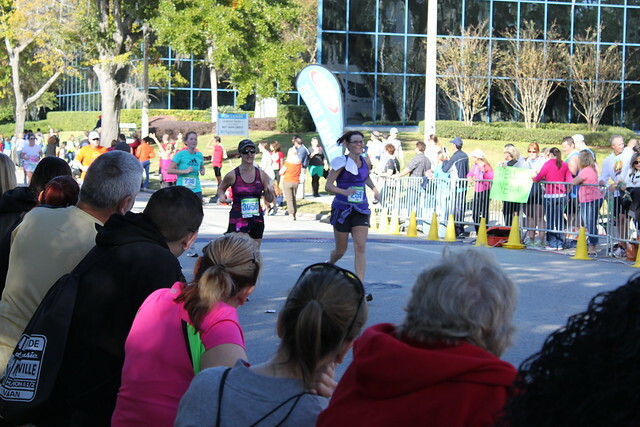 I learned a few things during my first half marathon. First, it’s ok to walk. And I was shocked how many actually do walk/run. and there is a complete “method” that you can follow to do a race this way. Second, I will never do a full marathon. I have absolutely no desire and cannot even imagine it. On the other hand, I may do another half. As hard as it was, I did enjoy it. that I realized I actually may do another before that. I honestly considered doing it, until I realized I will be out of town the same weekend. I was surprised at myself for not turning her down immediately. especially to my awesome hubby who was so amazingly supportive and my biggest fan. I can safely say that I have accomplished what I set out to do! Congrats! Amazing feeling to finish something like that isn’t it? Way to go, Kendra! You set your goal, trained for it, and achieved it! It doesn’t get any better than that! Kudos to you, and hubby, too! What a team! So proud of you!! I wish I could do it 🙂 You rock!! Hi! I know this is a little late…but congrats on your race! I’m happy you followed my plan and it worked for you! 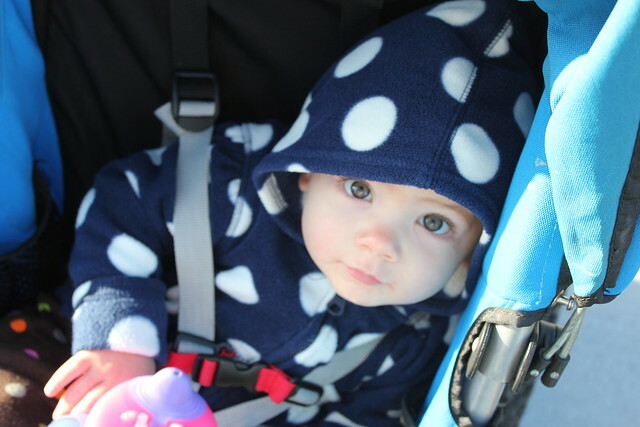 I just had a baby last year and have been doing most of my runs with the stroller! Keep up the good work!